Even if it does not require replacement, cleaning the air filter quarterly is one way to keep it clean in the meantime, between replacements. Dirt is the arch nemesis of your air conditioning and your heating system. When particles get into the heater it forces your machine to work a lot harder. The added dirt costs more because your air conditioning is working harder and longer. Many people are comfortable changing the filter. It is not new to them. The outdoor unit, though, tends to be out of sight and out of mind. The key to keeping everything in good order out in the compressor outside is to clear away the leaves and other debris. The key is to keep leaves and other garbage from getting lodged in the fan blades or other parts. It can help to use a soft brush to sweep crud off of the fins. It is ok to hose off the system as well periodically because it will clear airflow and improve efficiency. Another way to keep it running efficiently is to keep the vents clear. Move furniture out of the way. It is important that they remain clear to allow air to flow. Make a regular maintenance schedule to make it easier to keep on top of it. Put it on your calendar, and always have a heating and air professional come to your home once a year — to handle the air and the heat in the same visit when seasons change. This prevents problems by identifying them early. Duct work can end up with leaks that decrease efficiency. In addition, the coolant can leak out and make the air conditioning run hot or warm. Even the thermostat can run into problems as well. The heating and air professional also has the ability to run system diagnostics. This provides verification of issues and can help pinpoint what is causing them. Checking airflow through the evaporator coils is an example. Another big consideration is that the system is operating safely by looking at the electric sequence, such as how the system starts, runs, and shuts off. Following a professional inspection, maintenance requirements come into focus. This includes the blower cleaning and adjustment as well as the oiling of the motor and snugly re-fitting loose connections. They also will repair electrical problems, and even ensure proper drainage. 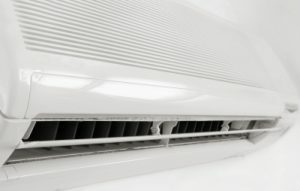 Maintaining an air conditioner will make the system work well all season while stretching the lifetime of the system.